Though generally a bit late on the technological fronts when it came to advanced aircraft, The Japanese were able to do research into gas turbine engines. The major problem they had was lack of the proper materials for high temperature areas. They also relied a great deal on German research, which in most cases, was more advanced than any of the other warring powers. However, the Japanese could not simply copy what was provided, but had to adapt the technology to specific Japanese needs. This led to very long gestation periods while the subject was adapted. This was quite true with engine technology. While the Japanese did get some very early turbojets, they used them more as technology demonstrators than as patterns. The Ne-12 turbojet that powered the Kikka was an axial flow engine like the BMW 003. In fact, these engines were designed and built just from photos of the BMW engine as none made it to Japan to be used as a pattern engine. They offered about 1,000 lbs of thrust and two were deemed sufficient to power the smaller Kikka jet. While two prototypes were completed, only one made a flight, and that on 7 August, 1945, just weeks before the end of the war. A second flight was aborted when the RATOG bottles caused problems due to being mounted at an incorrect angle. One of these planes, in rather sorry condition, still exists in the Smitsonian Institution. 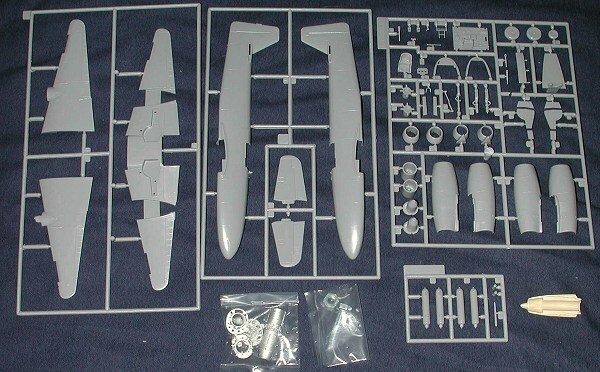 Those who have built Fine Molds kits before realize that they look like Hasegawa kits, they are boxed like Hasegawa kits, and have decals like Hasegawa kits. 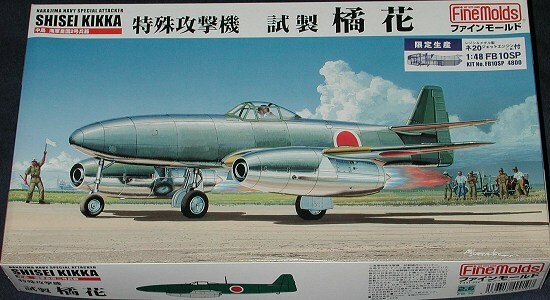 However, they are not Hasegawa kits and are generally a bit more difficult to build. I'd hesitate to call them short run, more like Dragon kits than anything else. The plastic is beautifully molded with excellent detail, including inside the fuselage halves on the sidewalls. I saw no sink marks, but did spot a few ejector marks that will have to be dealt with. The cockpit is quite complete with floor, seat, back frame rudder pedals and so on. Fine Molds has taken care of the tail sitting problem by providing a very large nut and bolt for ballast. A place is provided for it above the nose wheel well. Normally, this kit would be built with the engine panels closed, however, this seems to be a special boxing. A resin upper engine pylon section is provided with a superbly detailed bag of metal parts for the engine and nose section. You get what is basically a nearly complete engine with all the panels taken from the cowling. I'm sure that one could easily cut the old kit engine cowling for the needed panels if so desired for a diorama. The instructions are superb and provide clear constructio n sequences, colors used and an excellent history....if you read Japanese. Colors are give for Gunze paints and it is unfortunate that I cannot read some of the little notes and warnings given. A separate construction page is provided for the engine modification. Decals are typical Japanese in that they are a bit thick and probably a touch transparent as well. Markings for the prototype, which offer only generic material. The colors are Nakajima Navy Dark Green upper and IJN Grey undersides with yellow ID bands on the wing leading edges. I have built Fine Molds kits before and have had little trouble with them. If one is careful in construction, a fine model will result. I very much look forward to this one!